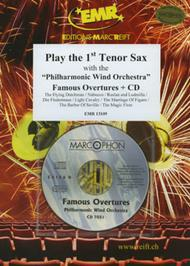 Overture to "Rusian and Ludmilla"
Overture to "The Barber of Seville (Il Barbiere di Siviglia)"
Overture to "The Flying Dutchman"
Overture to "The Magic Flute (Die Zauberflote)"
Overture to "The Marriage of Figaro (Le Nozze di Figaro)"
Play the 1st Tenor Sax with the Philharmonic Wind Orchestra (with CD) (Famous Overtures). Composed by Various. For Tenor Saxophone. Swiss import. Grade 4+-5. Songbook and Play-Along CD. Published by Editions Marc Reift (MA.EMR-13109).